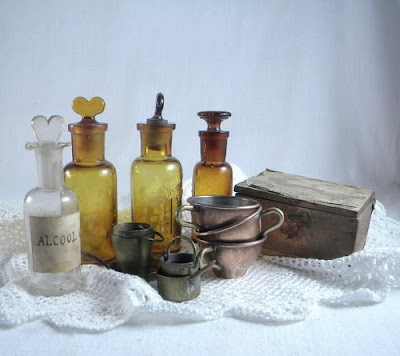 Boxes and vials. 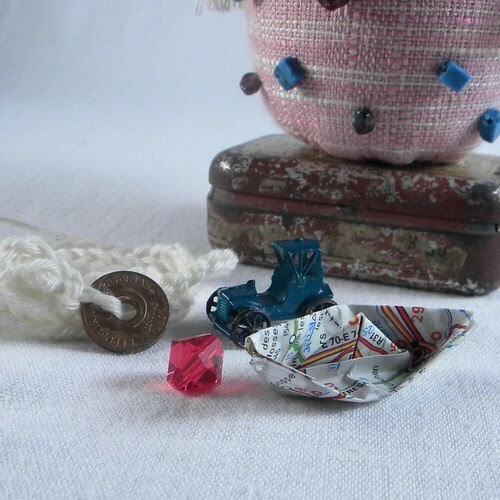 Teacups and mini pails. This weekend's outings proved fruitful. Here are just some of delightful objects we will be listing at the vintage shop starting today. Les boîtes et les flacons. Des tasses et des petits seaux. Voici quelques trouvailles de ce week-end. 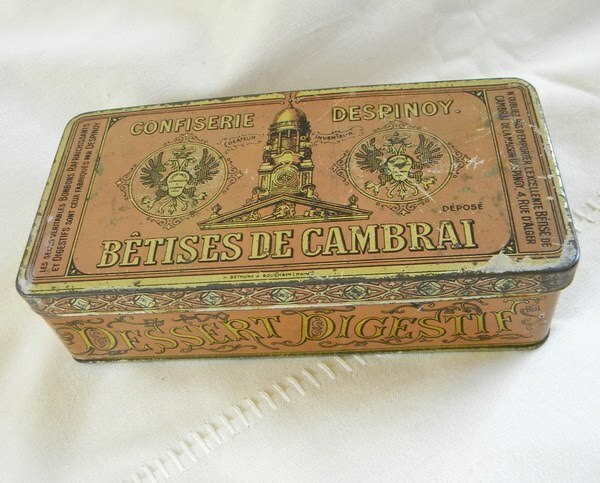 Ils vont être dans la boutique vintage à partir d'aujourd'hui. She is Dawn, the apple fairy who most loves to travel. In her suitcase she keeps an emergency supply of travel means -- a car and a boat. You never know with ash clouds, is her motto. When all else fails, she resorts to teleportation (done with a toss of her coin and a shake of a red bead), although this kind of gives her the creeps, and she really most prefers first class on a jet plane. 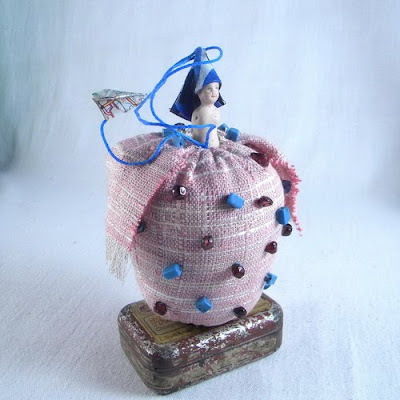 This fairy is named after the woman who gave me the pink fabric from which the apple is made, Dawn of La Touchables. Since an Apple a Day is an experiment in extending my creative reach, I decided that this was going to be one of those rare instances that I don't go for white or black or monochrome, and let myself be influenced by Dawn's genius for rich colors. The apply fairy, as well as yesterday's alphabet apple, will soon be available at the shop. 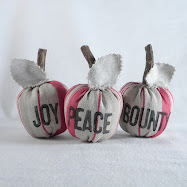 As promised, the stamped-all-over apple that I made yesterday is here today. The idea came from these vintage pencils that I've had forever. I always thought they'd make nice apple stems. On the apple, all the letters of the alphabet are stamped, from A to Z. For yesterday's Apple a Day project, I made the Bride. She will be in the shop soon. Today's apple is still drying (lots of stamping there!). You will see her tomorrow. Hier, pour mon projet, j'ai fait La Mariée. Elle sera bientôt dans la boutique. La pomme d'aujourd'hui est toujours en train de sécher. (Je l'ai imprimée à la main.) Vous la verrez demain. If an apple a day is supposed to keep the doctor away, then I'm willing to try it out! 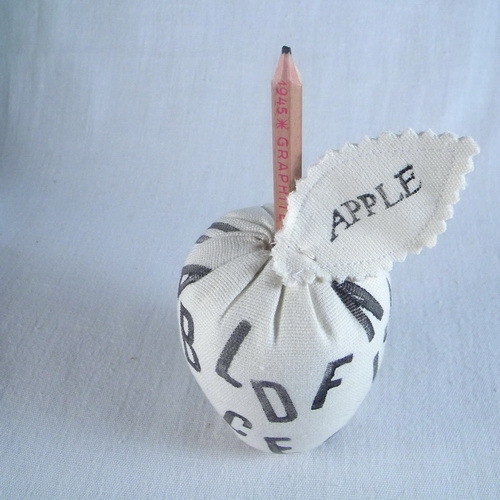 For the month of May, I am undertaking a personal project called An Apple a Day, where each weekday I'll try to create a new version of my popular plush apple. This is medicine for that little malady I have of going off in too many creative directions all at once, something I talked about a long time ago in my Featured Seller interview at Etsy, but with which I struggle up till now. Making a different apple every day will, I hope, strengthen my creative discipline, and at the same time help me explore a form that I know so well -- perhaps too well now that I've made around 700 of my white Inspiration Apples! 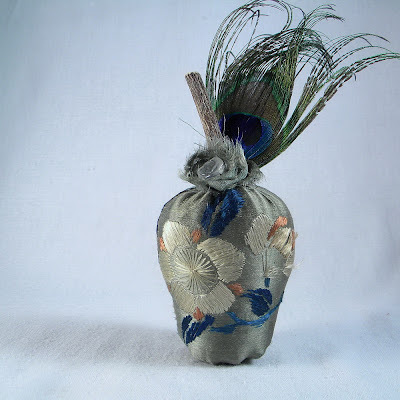 Kicking off the Apple a Day project is The Peacock, a lovely little diva made from silk and a feather. She is doing her show over here. Il y a une expression anglaise, "An apple a day keeps the doctor away." Une pomme par jour est censé éloigner le médecin. Si c'est vrai, alors je suis prête à essayer! Pour le mois de mai, chaque jour de semaine, je vais créer une nouvelle version de ma pomme blanche. Dans cette façon, j'essaie de me soigner de cette maladie créative dont je souffre, la tendance de m'éparpiller. J'ai parlé de cette tendance il y a longtemps dans mon interview sur Etsy, mais je lutte contre elle jusqu'à présent. Avec ce projet, j'espère renforcer ma discipline créative, et en même temps m'aider à explorer une forme que je connais si bien, peut-être trop bien maintenant que j'ai fait environ 700 de mes pommes blanches! 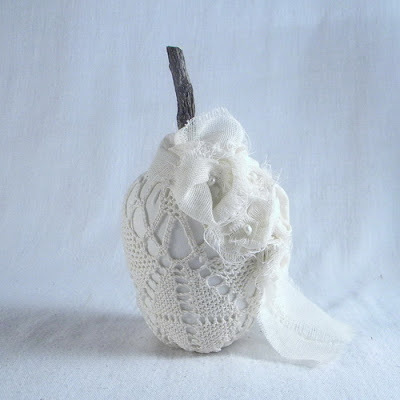 Le project The Apple a Day commence avec Le Paon, une jolie petite diva en soie et plume. Elle fait son show ici. Then yesterday we went to a vide-greniers or flea market in Beauvoisin ("Beautiful Neighbor," when translated -- a great name for a town, I think. 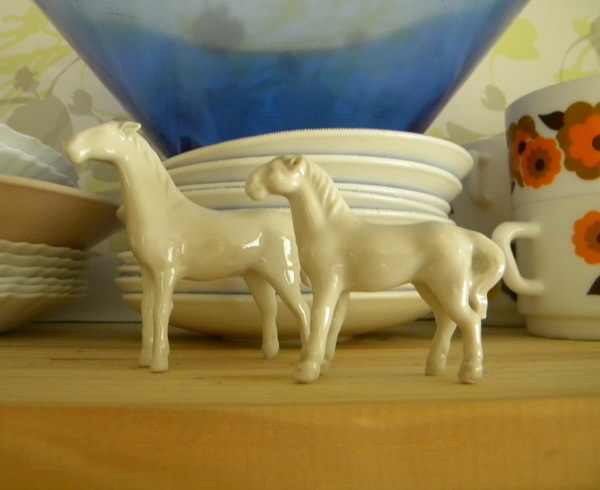 ), and there met a lady who was selling a ceramic horse, almost identical to mine but on the petite side. She explained to me that these horses are good-luck symbols specially appreciated here in this region where we live, where the lives of many people revolve around bulls and horses. There is even a breed of horse named after this place, the Camargue. You're supposed to collect seven, one horse to give you luck for every day of the week. I guess that means I have five more horses to go! P.S I joined my first swap, yes I did! I've always thought that swaps were a fun idea but never got around to joining one. Then I read about Kellie's Love Vintage Package Exchange a few weeks ago. Hey, I told myself, I love vintage, adore making nice packages, and admire Kellie's rice babies, especially since my own baby is a rice kind of baby herself. (Okay, half rice, half bread-with-cheese, to be more accurate.) I decided it was time to jump in. I'm excited! I'll give you a peek into my package when it's done; I plan to fill this little box with trinkets my swap partner might enjoy. Puis, hier, nous sommes allés au vide-grenier de Beauvoisin (Quel joli nom pour une ville! ), et y avons rencontré une dame qui vendait un cheval presque identique au mien, mais plus petit. Elle m'a expliqué que ces chevaux sont des portes-bonheur particulièrement apprécié ici, dans cette région où la vie de nombreuses personnes tournent autour de taureaux et de chevaux. Il y a même une race de cheval nommé d'après cet endroit, la Camargue. 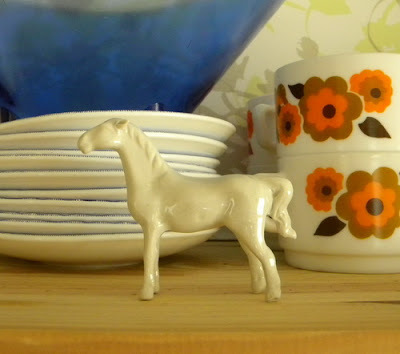 Vous êtes censé recueillir sept, un cheval pour chaque jour de la semaine. J'ai cinq chevaux de plus à trouver! P.S Je participe a mon premier "swap"! J'ai toujours pensé que ces échanges sont géniaux, mais jamais eu le temps de me joindre à un. Puis il y a quelques semaines, j'ai vu Kellie's Love Vintage Package Exchange. Je me suis dit, j'aime vintage, adore faire des jolis paquets, et admire les "rice babies" de Kellie, surtout parce que mon propre bébé est une sorte de "rice baby." (Okay, moitié riz, moitié pain avec du fromage, pour être plus précis.) J'ai décidé qu'il était temps! Je suis très excité! J'ai l'intention de remplir cette boîte avec beaucoup de jolies choses. 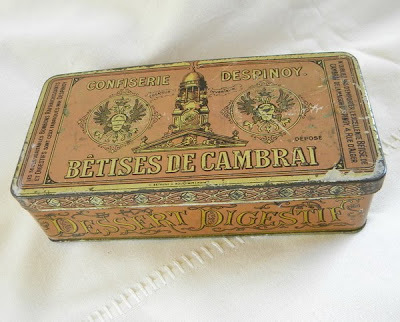 Je vais vous donner un coup d'oeil quand mon "Vintage Package" est fait.